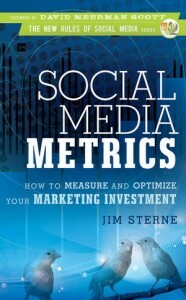 The purpose of Social Media Metrics, subtitled “How to Measure and Optimize Your Marketing Investment,” by Jim Sterne is not to convince companies about the importance of social media: “If you’re still not sure whether social media is important or is important to your company, save this book for later.” I’d love every company to read this statement as a litotes of sorts and realize that understanding what social media metrics is about is precisely an excellent pathway to understanding how important social media is. And there is a lot to do there! Jason Falls from Social Media Today reports interesting findings from a survey by City bank asking 550 small business owners across America about Internet and social media use for their companies: 81 percent don’t use social media! It’s hard to believe that these companies exclusively address people that live only offline when 71% of the total population is online (according to a recent eMarketer report). It’s safer to assume that many businesses have been deterred by the noise around social media, preventing them from understanding that the purpose of getting involved in social media is to build up metrics-driven marketing campaigns. To make a long story short: yes, this book addresses any business owner or marketer and gives them reasons to buy into social media. The book starts with the 100 ways to measure social media in November 2009 by David Berkowitz, and once you know that, you must identify your goals and define the KPIs that indicate how efficiently such goals are met – and get inspired by Katie Delahaye Paine‘s measurement standards. When your goals are clear, you want to get attention and know if your message is reaching the right people, and the nature and the scope of their influence (that Jim Sterne designates through a neologism “influencity”. Ultimately you want to identify your actual amplifiers, i.e. the people who expand the impact of your message, making sure they stay engaged – and sit high on the “engagement food chain.” However, winning people’s hearts and minds also requires a real and continuous commitment from marketers to listen methodically, as recommended by Jeremiah Owyang in his Eight Stages of Listening, participating in the conversation and eventually anticipating followers’ expectations, and by doing so, driving and accelerating favorable business outcomes. Now convince your boss or your colleagues, and do so by showing to them that social media is not a touchy-feely story, but an end-to-end metrics-driven process! – It’s an action-oriented framework with minimal blah blah. – Jim Sterne doesn’t try to reinvent it all, and refers oecumenically (and relevantly) to a variety of authors, consultants, and practitioners. Although the book offers an appendix of important resources, marketers who are new to social media metrics would benefit from a summary bibliography and linkography. Yes, it’s nice when somebody writes a flattering review of one of my books, but when that review sends me scampering to the dictionary (litotes! neologism! oecumenically!) and includes the phrase, “It’s an action-oriented framework with minimal blah blah,” then I am well and truly smitten. Marylene, would you have been my Valentine?